Electric chain hoists supplied by Source Industrial Services are always built with both durability and convenience in mind. We’ve made an excellent choice to partner up with Stahl as one of their highly recommended electric chain hoist suppliers and are proud to represent their brand. We’re proud because their products are number one in the material handling industry and are well-known for being very low maintenance. There are not many 2t electric chain hoist manufacturers around who provide a robust construction and numerous customization options to suit the specific industry that your in. We can even select the ideal explosion proof electric chain hoist for your company’s application to ensure your employees are safe. Are you looking for a time tested chain hoist Ontario based companies can count on for safety, strength, dependability, and economical operation. This series of overhead electric chain hoists come in thirteen different safe working load options that vary from one hundred and twenty five kilograms all the way up to sixty three hundred kilograms. Depending on your application you will either require an electric chain hoist with electric trolley or a hoist that is hook mounted to a fixed structure. Manual push trolleys are also available options when purchasing. 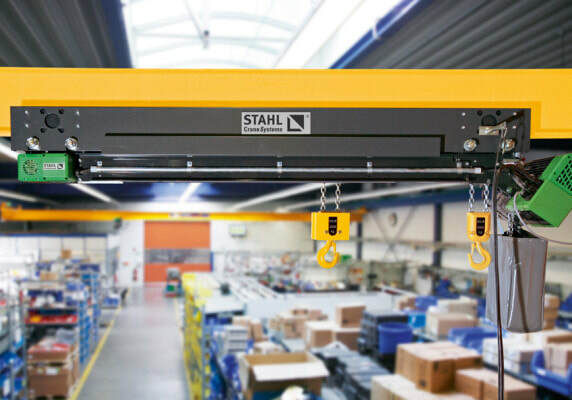 Whats better than one Stahl electric chain hoist with motorized trolley? Well the answer is simple; 2 of them! We’ve developed a solution for all of your wide and long loading issues where you’re require to lift your load from 2 separate points. This configuration uses a single motor for hoisting which ensures a perfectly synchronized lift from both of the lifting points. Minimal maintenance is required on these products because they are built with fine German parts. This lifting system is configured with perfectly synchronized lifting; not just the first time but on every lift. When you need Extra Low Headroom Electric Chain Hoists we can help with the STK series know for its remarkable space saving design. 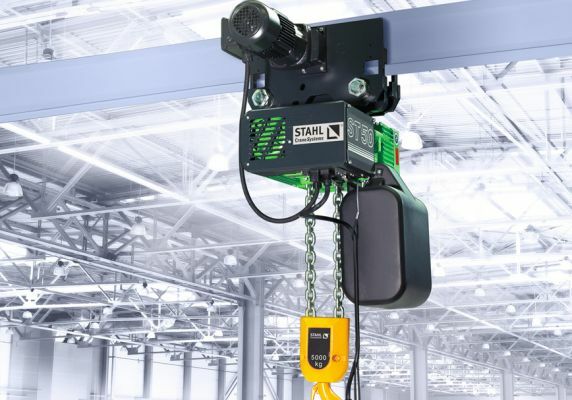 If you’re short on headroom and require a 3 ton chain hoist then Stahl is your best option as our configuration saves you approximately sixty percent compared to standard models. Our 1.5 ton electric chain hoist and trolley option is the perfect product for buildings that have very low ceilings. ​Stahl hoists are known for being a bench mark across the industry and across the entire world for both quality and reliability. 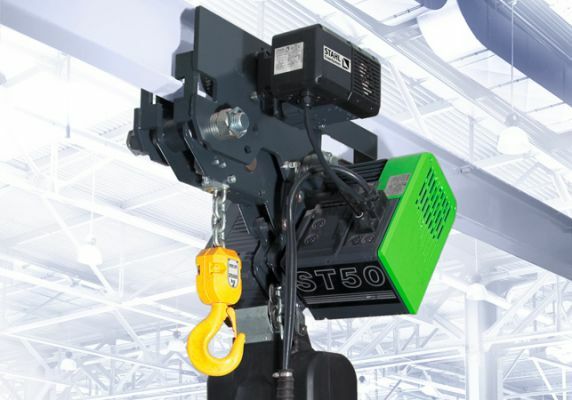 Custom Chain Hoists SolutionsIt doesn’t matter if you’re looking for a 6 ton chain hoist or even a 10 ton electric chain hoist with trolley; the experts at Source Industrial are well-versed in providing custom lifting solutions for all of your challenges. We have the knowledge and years of hands on experience which gives our company the upper hand when it comes to designing, fabricating, supplying, and manufacturing the perfect products and pieces of lifting equipment for your facilities. Many people believe that custom options are very time consuming and come with an extensive lead time. In some cases this can be true; however, our engineers have worked on many unique projects and many times you’ll find that we may have already solved your issue for another client in the past. Our team and network of professionals have over one hundred years of experience and we always use field tested standard parts so maintenance is not a hassle. We also are able to integrate new equipment seamlessly into your current process and do so with safety, price, and dependability in mind. For more information on our various types and lines of electric chain hoists be sure to reach out to use by calling 1-866-829-3344 or by completing the contact form on this page. We can also help your company in you are in need of an overhead travelling crane as Source Industrial has division devoted to the engineering and manufacturing of industrial cranes.